Born in Kokstad André de Wet went to Selborne College in East London and played for Border Schools in 1964 before going off to Stellenbosch where he studied to become a pharmacist and played for Western Province. 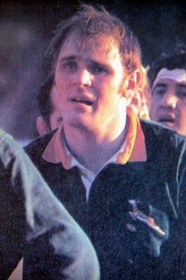 He was playing for Western Province when he played at lock in two Tests against the 1969 Wallabies. On the 'demo' tour of 1969-70 he played in nine matches, including the Test against England. He returned to East London, played for Border and became a member of parliament, first representing the Democratic Party and later the National Congress. In 1994 he became a member of the Provincial Legislature of the Eastern Cape.